The title panel for "A Time of Great Possibility: African American Identity Politics, Community Building, and Racial Destiny, 1900-1940," the exhibit that resulted from the course "Looking at the Familiar: History, Memory, Race and Visual Culture." Emory junior David John Williams says he found a new way of looking at history in the course he's just completed, titled "Looking at the Familiar: History, Memory and Visual Culture." Instead of reading conventional textbooks, Williams was searching through letters, documents, photographs and ephemera found in the African American Collection in Emory's Manuscript, Archives and Rare Book Library. Instead of writing the standard final research paper, Williams helped conceive of, design and create an exhibition that is now on display on Level 2 of Emory's Woodruff Library. Titled, "A Time of Great Possibility: African American Identity Politics, Community Building and Racial Destiny, 1900-1940," the exhibit is the product of the course, in which Williams worked with Pellom McDaniels, assistant professor of African American Studies and faculty curator of the African American Collection in MARBL. Originally designed as a course for 10 to 15 students, Williams was the only student to sign up for the course and gain practical experience as a historian and researcher using skill developed during the semester. With some minor adjustments, McDaniels decided to "follow the path laid out by the syllabus," which entailed using MARBL's rich collections to create an exhibit based on original research. With that broad mandate, Williams and McDaniels began to hone the narrative they wanted to create. "First we had to choose a specific time period that we thought would be important to cover and that we could get materials for," says Williams. They decided on 1900-1940. African American Studies professor Pellom McDaniels (above) designed the course, "Looking at the Familiar: History, Memory and Visual Culture." As their exhibit panel reads: "The beginning of the 20th century marked a crucial point in history for African Americans. It was here where an increasing number of African Americans began to make great strides to advance the community's social, economic and political position in the United States." The exhibit includes five different topic areas — education, family, politics, religion and sports — all of which are richly supported with materials from MARBL's African American collection. 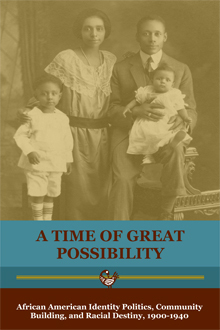 One product of Williams' research featured in the exhibit is the story of African American educator S. Rufus Youngblood (1862-1938), a native of Orangeburg, S.C., who moved to Langston, Okla., in 1909 to work for what is now Langston University. "I found letters from the [Greene County, Ga.] Board of Education to Youngblood, declaring his acceptance as a teacher. We also have his teaching license, which is proof of his accomplishments," says Williams. McDaniels gives full credit to Williams for finding and explaining the significance of educators such as Youngblood in contributing to the developing African American identity. "For Youngblood and many other African Americans, you see both the intended and unintended consequences related to the choices they made," says McDaniels. Williams, a history and sociology major, says the encounter with primary evidence in the form of records of everyday people drew him in. "The research for projects like these is much more involved, so the things you pick up tend to stick with you more," he says. "You tend to remember personal details and names of people who aren't necessarily the ones who get mentioned on public holidays or in newspapers, but are no less important or significant."